ABOUT Sixteen Voices is a lot for a real analogue Synth. 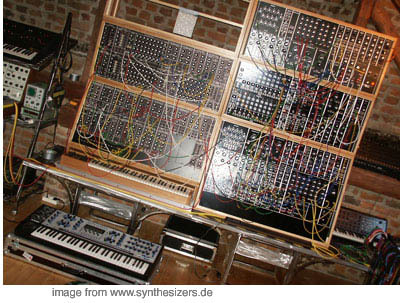 It has Oberheim and Moog Filters and a sophisticaed destination-orineted modulation system. The Envelopes are fast (when optimizer is set to ultra percussive) and has a ribbon controller and FM- a real flag ship starting where the memorymoog stopped. btw: cheap for what it can do. 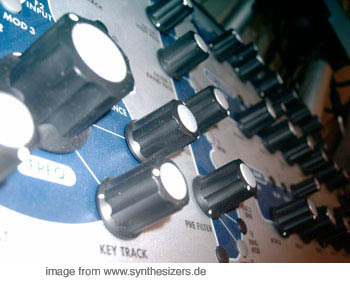 ABOUT Sechzehn Stimmen sind sehr viel für einen analogen Synthesizer, er hat dazu noch Moog und Oberheim Filter und ein Ziel-orientiertes Modulationssystem. Die Hüllkurven sind sehr schnell (wenn der Engine Optimizer auf ultra percussive steht), bietet einen Ribbon Controller und FM. Wirklich ein Schlachtschiff, was da anfängt wo der Memorymoog aufhörte. günstig, wenn man bedenkt, was er kann. SOUND FX with lots of movement, basses, pads and even click-sounds (those modern ones) because of the fast envs..
one of 250 red "A5 in the order catalogue": the A6! rot und limitiert. es gab 250 stück. btw: the OS or bankloader is a .SYX file: to upload it to your andromeda on the mac use "SysEx" from Steven L. Grace (free!). it comes as a ZIP files (the bootloader, too)..
how to deal with SYX files on mac and pc check under SOFTWARE ON THIS SITE!! editing andromeda and managing sounds? use soundiver (emagic now apple)! worx fine! if you still have it..
ein prog für den lieben mac mit good ol' OMS 2.37 oder 2.38 lauffähig..
how to make FAT SOUNDS? From a comparison between a Minimoog and an Andy on TGS, the concept became clear that the non-linear keytracking on the Mini adds a lot of character so I encourage you to use the tracking generator to subtly (or not) detune the oscillators at strategic points across the keyboard as the old oscillators were scaled. A very quick example of how to make Andromeda a bit fuller if you want it to be. Start with Pim's fabulous "Brain Activity" (Preset 1, 000). Turn off all of the Mods to both Filters. Set the F2 Input to Mix. and keep the Level the same. Set Envelope 2's Decay 1 Stage to a slope of Log 3. Set Envelope 3's D1 Time to 4ms. Set Envelope 3's D2 Time to 322ms. Set Keyboard Mode to Poly. Readjust Filter 1's Offset parameter for the best bass. Bring the Voice Mix Level up to maximum. btw: The “fizzy-sounding” clipping that the Pre Filter Mix can produce is also possible in the Post Filter Mix, so take care to keep the sum total of all active Filter Levels below 100 (for example, Filter 1 BP: 29 and Filter 2: 65). Adjust to taste. It has been found that closing-filter sounds such as dark brass can cause this “fizz” even at a Filter 2 Level of 60, when it is the only Filter active in the buss. There is gain available in such cases at the Voice Mix Level control. wie man einen fetten androsound hinbekommt (nicht sooo schwer)..
how to RESET the A6? How to reset the Andromeda? Try a soft reset (power-cycle while holding soft button four) and see it it works. If not, save your programs and power-cycle again while holding soft button three (which, as implied, will wipe the programs). That's a hard reset, and will clear the tuning tables and start the process a new. A6 current os? how to check version? Want to see the current OS in the A6? the display. Version should be .. uhm: CURRENT OS is 1.40.12 , simply check it from time to time ;), If it's older than that, you'll need : Alesis dicontinued the development ,so 1.40.12 should be the last one, they say the ion sells better and the old andro team does no longer work for alesis, so no chance for a rack or update.. but it will be sold for some time.. long life to andromeda!! CURRENT OS is 1.40.13beta but 1.40.12 is the last one available , simply check it from time to time ;) but be sure (as said) there will be no newer version for above reason..
the process menu has a very nice feature: the engine optimizer,that optimizes the ENV and other curves to fast, ultra fast, slow or normal setting.. means: if you want mit most percussive, go to process - engine optimizer and set it to ultra fast or percussive.. now the ENVs are much "faster" and you got a bigger range in the fast range!!! hope that will come into other synthesizers,too!! ie about _60_ bucks cheaper and they ship worldwide AT ACTUAL COST!!! other companies tried to charge me 40 -50 bucks for sending just one card to Europe. The staff at tima went to great length to help me out and were very friendly to boot. You can order it from TEC.SYS in Germany (www.tecsys.de) I got mine from them, and I believe other members did it too. The reference is SJA-002M5C (pcmcia sram, 2Mb memorycard, 68-polig) but if you ask, they know exactly what is needed for the Andromeda. don't try others! only 2MB cards seem to work well..
you might try a pcmcia to compact flash adapter (9.90€) and some CF card.. of course 2MB ist still maximum.. but: i did not try it. it works on the vsynth! I don't believe it works! Bei TecSys wollen sie 87 € für eine 2 MB-Karte. (danke an Jörg für das sammeln der alten infos aus dem ebenso alten forum) - neue Fragen bitte ins forum posten!!.. MORE PUNCH / MORE SMOOTH?? There is one global random number generated every cycle (2ms). The LFOs are run on a different timebase from the random number generator.Each LFO grabs the current global random number and uses that as it's noise output. So while it's possible that more than one LFO will use the same number, in practice the random number changes often enough that each LFO will have a unique output. LFOs are sooo slow?? (too fast?) well maybe we'll get around 10Hz more in the future.. so maybe 40Hz is a realistic wish.. but as long they are too slow: set an Envelope to Loop between Attack and Decay1 and route it to the desired destination and set their rates to very low amounts (try the lowest and go ONE step higher)..
if you want to mod the speed: mod the Attack and Decay.. you can also set Attack or Decay to 0 to get a Saw (up/down).. and note: if you have both: you are modding the SYMMETRY.. so mod both and you have a speed modable LFO that can be very fast..
(danke an Jörg für das sammeln der alten infos aus meinem alten forum) - neue Fragen bitte ins forum posten!!.. Sometimes you really want more than the OSCs FM? Or better: a faster LFO So use a looped ENV by setting it to loop mode between AD or AD2D2 mode..
Now you have a much faster lfo. Control it moding A and D! Shapes: use the curve shape!! I certainly have an interest in slow stuff like that.. I'm the guy who insisted that the LFOs be able to go as slowly as they do (but the hardware is what limits the upper rate, which we looked into opening even 10Hz more, but with large modulations you could hear the digitization, too much so we kept it where it was--sorry). The envelopes actually run on a much faster cycle than the LFOs. The envelopes also loop. This means, if you want that faster-than-25Hz cycle on the LFOs, there is a way! FAST TRIANGLE LFO: Set the envelope attack to 2ms. Set the envelope decay 1 to 2ms and then drop D2 level to the lowest level. For a triangle LFO, you set the slopes of the envelopes to linear; you can experiment with various slope rates as well. Now, go to Loop (soft button 5). Set the start at attack, and the end at decay 1. Set the loop type to FORWARD. This will give you a 250Hz LFO to work with. For a 500Hz LFO, you can try setting the start and end at attack and set the loop type to ROKROL. FAST POSITIVE SINE LFO: You can also do a positive-wave sine wave with a looping envelope. Set the attack speed at 2ms, and the slope as EXP 3. Forget about the rest. Now, go to Loop. Set the start and end at attack. Set the loop type to FORWARD. Set the looping to ROKROL. FAST SAW LFO: Set the envelope attack to 2ms. Set the slopes of the attack to linear. Now, go to Loop (soft button 5). Set the start at attack, and the end at attach. Set the loop type to FORWARD. This will give you a 5000Hz saw LFO. 1 / (Total milliseconds of envelope / 1000) = n Hz. And get a nice small envelope! AUF DEUTSCH: in german: Man loope die Hüllkurve zwischen den Segmenten Attack und Decay1 und stelle sie auf einen sehr kurzen Wert.Dieser so entstehenden LFO ist wesentlich schneller als die LFOs im Andromeda, daher im "Andy" ein "Muss".. im Q aber immernoch nicht lahm und im XT ebenso nicht schlecht für LFOhungrige.. auch wenn der Q ja 3 schneeeellle LFOs hat.. Attack und Decay! !..einfach durch Velocity oder ModWheel oder was anderes interesessantes (ein anderer LFO ;) modulieren..
Das funktioniert auch bei anderen Synth mit Loopbarer ENV. Actually, we chose both because in the shoot-out we had with all of our analogs in the same room (quite a sight! ), the Moog Modular and Four Voice (4 SEM Modules) were quite obviously the best-sounding synths, with the (Roland) SH5 filter coming in behind the (Oberheim) SEM. The choice was not marketing driven, but engineering driven. 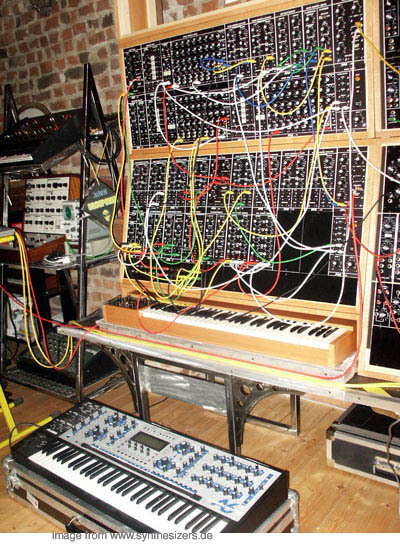 We were fascinated with the possibility of playing a polyphonic Moog Modular. There were no "runners-up", per se, only options which we didn't all agree upon. None of us own a Juno of any type. None of us have since bought one. We were interested in capturing what was not only to our ears, the best sound, but the least available as well. 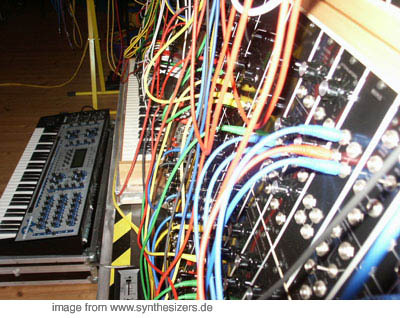 http://www.thetank.com My Moog Modular was used and ispictured on his first solo CD, Threshold. A top discrete modular such as the Technosaurus or 700 will undoubtedly exhibit more depth, dynamic range, and body.The Minimoog Voyager will be larger-sounding than A6 if the Moogerfoogers are any indication. 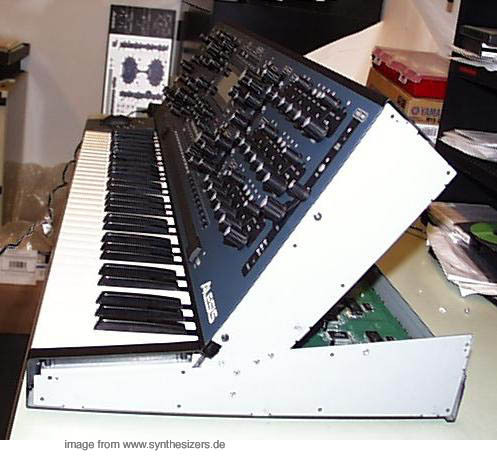 If Andromeda actually had the meat of a Minimoog, it would never fit into a mix! Hence the folks on TGS defending the Juno 106, saying it easily fits into a mix. That is a good point, and why some instruments become favored over others. 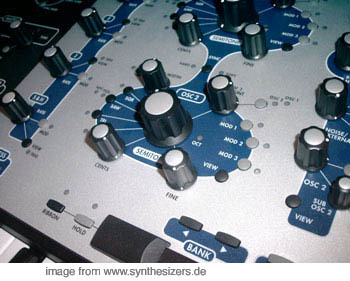 warum der a6 moog und oberheim sem filter hat.. Audio Rate FM, Oscillators and Filters-Analog Noise can be used as audio into the Filters by selecting a Noise Type and Level in the Pre Filter Mix module and then turning Soft Pot 8 on that page to Enable Aud In. Noise can also be used to modulate the Filter frequencies. Turn Aud In to Off, press the View button on the Filter(s) you wish to modulate, and use Soft Pot 8 to select Ext In. The Pre Filter Mix Noise Level pot will then act as an attenuator for the modulation. The Mod on this pot will act as a dynamic modulator of this route. -Note that the analog noise cannot be used as a signal source into the Filters when using the external Filter modulation CV path. between voices when using it. Optimization can be done by using an input voltage that swings between zero and five volts DC. 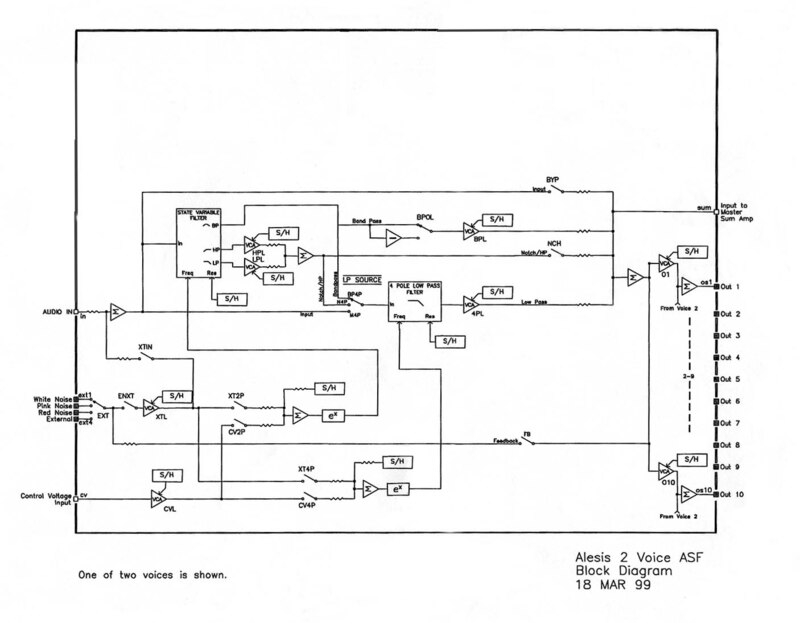 AUD IN is a switch which enables/disables the VCA path to the Filter audio inputs. You of course do not want a DC CV signal running into the filter audio inputs... And in the cases where you want to FM the filters with Noise or the External Audio signal but not hear them filtered simultaneously, you turn AUD IN to OFF. It would be nice to have separate signal paths for each of these but there weren't enough pins on the chips, space for the VCAs on the chips, and time to make it happen. 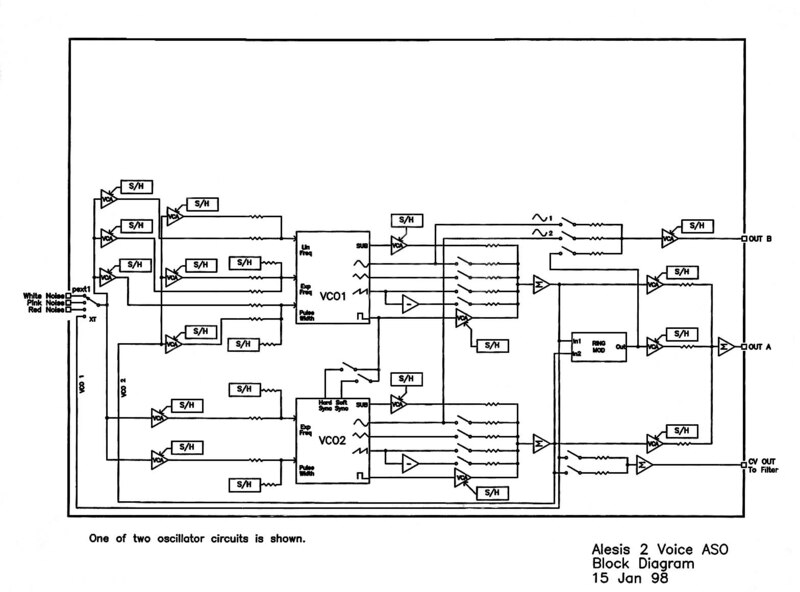 SO: It's a shared VCA. Yeah, that would have done it. It was reportedly far more difficult to transfer a non-linear Q design like the Moog 904a into VLSI than the constant-Q mod which was used. I'd like to be pretentious for a moment (when are you not, they ask) and give respect for those who make analogs full-time.Considering the difficulties this entails, it's obviously a labor of love. I know that these points are not a true response to the questions at hand. As I've said, enjoy it for what it is, because the hardware ain't changing anytime soon. And that's a figure of speech; there are no hardware changes planned or in progress. WHAT IS SOFTSYNC ? HOW DOES IT WORK? I don't know much about how Soft-sync works but it does seem to change tone depending on how the phase of the VCO waveforms are lined up. If I press it on, and off about ten times, you here a different tone at each of the 1 tries. most of them similar, but a few of em will be heavily phase cancelled and tiny. Is this how it works? Generally the way synch works when VCO2 is synched to VCO1, is that every time the VCO1 waveform has a positive-going zero crossing (i.e. begins its cycle), the waveform of VCO2 is reset to the beginning of ITS cycle. That's hard synch. With soft synch, the VCO2 waveform does NOT reset for every time VCO1 begins its cycle. It only resets if it is near the end of its cycle, and about to reset anyway. with the master if their tuning relationships are consonant (octaves, fifths, etc.) It is often neccessary to tune the slave oscillator flat several cents in order to achieve a lock. Check "70's Lead" for a soft-sync'd sound and check the tuning of osc 2. Note that the timbre of a soft-synch'd oscillator changes a bit, even if the master and slave are at the same frequency. In hard sync, the slave becomes a generator of harmonics as it attempts to both freerun and also reset to the rising edge of the master's waveform cycle. Not all voices will accurately soft sync due to the compromise between the sensitivity requirements of the circuit and the differences in tone which occur. It is an effect which is great for organ sounds (pipe and otherwise) and for firmer bass sounds as well. I've found that if the slave is tuned -below- the master, it will lock a bit better (and IIRC, it's tone is a bit cleaner. the Morg Garson "Moog" records such as Black Mass. So with soft synch, if VCO1 & VCO2 at close frequencies, BUT freerunning,whether or not VCO2 will synch to VCO1 may vary based on slight phase/frequency differences between the two oscillators. And as those differences will change over time, yes, the synched sound may vary depending on exactly when you hit the "synch" button. If you don't have the slave oscillator detuned into the "groove" which allows soft synch to lock, it can jump in and out of synch creating it's own effect. James Reynolds created a sound, "Faux Organ" in the factory presets which takes advantage of this effect, IIRC. Filter 1 is based upon the SEM, which is a standard state-variable design consisting of two 6dB poles in series. The different responses are tapped from different places in the circuit path. As the HP and LP are series, they are 12dB response; the BPF (as the Notch) is of course one 6dB pole HP into one 6dB pole LP (I believe that's the order) so their response is a 6dB slope on either side of Fc. As there are only two poles to play with, it can't be steeper than this. The Xpander has four configurable poles to play with so you can achieve 12dB BP and Notch response, as well as on the Chroma (damn, it's a pair of 12dBs, right? I'm so damn forgetful). 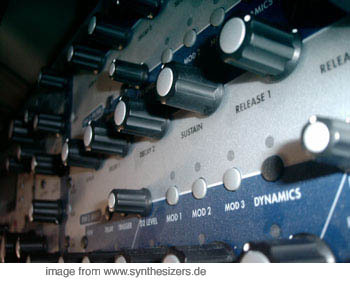 A 24dB response is possible using of course two individual 24dB HP and LPs in series, as on the Moog Modular. In terms of where the filtering starts and stops (the width of the BPF), it should be 3dB down outside a fairly tight peak which would get tighter with increasing resonance. MC will know how wide that is in a SV filter. TIP: SNAP and JUMP knob modes? in the last weeks I began missing an important parameter (or I don't find it....). Working live on my A6 and modulating sounds by the knobs I have always these evil jumps. Is there any chance to add such an important parameter? and turn soft pot three to ALL. To upgrade your existing a6 to the new panels, slight modifications will be needed. These are beta panels and do not include a hole for "off" on the main output. There's an "off" hole? I only see "Main" and "aux", and there isn't an indicator pictured on the Alesis site either. When I set mine to "Off" the lights just go out. The older dark blue panels have an "OFF" LED hole above MAIN and AUX, but they realized that "no light" was the same as a light to indicate this state, and it saved an LED as well. There are probably only five of the gray panel in existence. - Input LPF under 6k are more realistic. I went through almost all of the programs in a Lexicon 480 and the LPFs were between 2k and 6k. - Density and Diffusion no higher than 80% in most cases. I think that's the default. If the reverb has a metallic ring or you want more character, lower these values. - Swirl is almost always a bad idea, unless you want an effect. - If the Predelay is under 50ms or so and you increase Predelay Mix, the reverb will be out of phase. So Predelay Mix is only nice at longer predelay times, otherwise it should be 100%. - The Damping is nice for adding depth to the reverb,and sounds more realistic. Another trick I've been doing with the effects is using the dual mono effects with direct going left and effects going right. I write a pad program, say, and pan it all the way left in the Voice Mix section. Then I send it to a Dly:Dly or Chorus:Chorus program. But the output of the left effect is all the way down at 0%. This gives you a really wide chorus effect. Truth be told, the Wedge sounds better than the A6 effects to me. I've A/Bed a few programs and the Wedge is a bit sweeter for some reason. Here are a few Flange programs that I copied over and that sound pretty good. editing your a6 via computer? ok who cares? but managing sounds works great with emagic sounddiver (V3.05) on mac and pc. use "sysex" for mac and midiox.com for pc to upload new .syx files (OS!) to the a6! FM on the andromeda? what is it good for??.. Well you can mod the filters in audio speed!! This allows us to have interesting nice spectra using the filter as an oscillator (with resonance!).. If you want some subtle dirt or not-so-subtle heavy "aliasing"-like sounds you can use it to create intereting "overtones"..
Well, you never used it on your Q? Any synth that has "audio speed lfos" like the jupiter 4,the andro or Q etc.. are known for their FX sounds using this feature.. If you did not ever touch any FM synth (well you still have one!!) first try 2 OSCs . Say osc1 mods the frequency of OSC2. This lets OSC2 become sound "metallic" the more influence of OSC1's frequency you send to OSC2!.. There are lots of sounds, use an envelope to control the FM!! So you got 2 Ops of the DX7!! the carrier always controls the amplitude/volume, but the modulator controls the harmonic content. Use SINE WAVES!!! why? They consist of NO OVERTONES!! Hope that helped a bit..
You did know,that the Q has very fast LFOs?.. On the andromeda you can mod filter 1 directly by OSC ! The filter 2 can also be used ,but you only have an offset!!.. So be careful adjusting the FM amount.. Results are quite large.. Especially on filter 2 with resonating filter!! So you can have 2 OP FM on the andro this way, or use 2 OSCs..
the andros aberheim filters are also like this: the chracteristics are very much the SEM and a bit xpander style..
the VCFs (904) are also the same: the andro sounds GREAT, but the moog still is the only one that sounds a bit "more" into all of those things like broadness, "fatness", brilliance.. I'd say it's not the difference between a VA and a real analogue.. it's more close .. it's more like twins! they are the same, but still a little difference .. say same family and no doubt about the sound.. it's a moog! btw: the sem also sounds very authentic.. seems the same situation.. no andro user should regret to buy it!!.. ;)) the nicest portable moog ever made.. the only 2 things that are a bit better are voyager and moog modular. both: andromeda and modular users will not regret to still have it..
sounds to compare yourself will follow end september here! compared: a6 vs. Waldorf go..
now incl. wooden side panels and more mods..
update: seems Kris removed the nice pics..
kris rhens aurora mod - klick auf das bild..